Will you be contesting the closure of Lord Street? I have been advised that the current proposal is for road closures to take place for up to ten weeks on week days only between 9.30am and 3.30pm, with temporary traffic lights in place for the hours that the road is not fully closed. The closure of Lord Street is to enable a connection to the various utilities, namely gas, water and sewer. This is a matter for the developer, the utility companies involved and the local highway authority (Hertfordshire County Council). 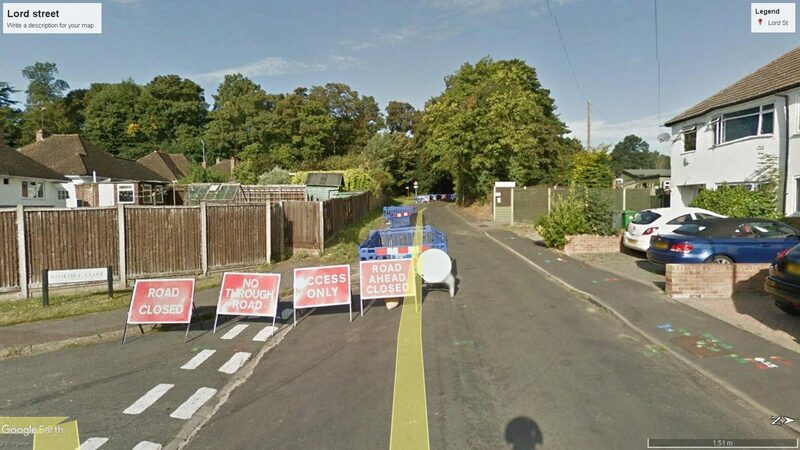 Broxbourne Borough Council does not have any powers to intervene in the statutory process of determining whether or not the road can be closed and the method of doing so. The County Council has responded and explained the relevant duties and powers. Where will residents of Lord Street park if the road is closed? With regard to parking, I would expect there to be some liaison with local residents by one or more of the above parties. Again, the Borough Council has no role in determining how and when utility connections are made. You will be aware of the County Council’s response. Will deliveries from Royal Mail, Amazon or food shopping orders be affected by the closure? My understanding is that the developer will be exploring whether specific arrangements can be made to enable deliveries during the road closure period. This is explained in more detail in the County Council’s response. Will the suggested diversion, Mangrove Road, be regularly gritted in the colder months? The Borough Council has no involvement in gritting operations on the public highway. This is a matter for Hertfordshire County Council as the local highway authority. Will refuge collection including green waste, food waste, general waste or recycling be affected by the closure of Lord Street? When were you informed that Lord Street would be closed for utilities to be installed for High Leigh Garden Village? The Council’s Planning Officers were made aware of the closure proposals at the end of November when Political Developments & Intelligence approached residents and Ward Councillors. Were these utilities works always planned to occur on Lord Street in regards to High Leigh Garden Village? We have only recently discovered this is happening, so are quite shocked. Why are these utilities works not mentioned in the planning permission document? There is a sub-station approved next to Lord Street so it was apparent during the processing of the application that power would be drawn from that general direction. The Council’s Planning & Regulatory Committee was made aware when the scheme was approved that foul water disposal would be via Lord Street and that an upgraded main would be needed if the whole southern part of the development were to be served with potable water from Lord Street. I would add however that the supply of utilities does not normally require planning permission when arranged by statutory undertakers. It seems a deceptive for council members to state what Lord Street would be used for and later breach the agreements reached at The Spotlight. Why were assurances given to residents in regards to the use of Lord Street at The Spotlight, Broxbourne Civic Hall. We were told it would only be used for emergency access and limited access to the development. All of the new development to the north of Lord Street will take road access from the new dumbbell roundabout junction on the main road between the A10 and the town centre. The only part of the development to take access from Lord Street will be the proposed sports pitches and pavilion and a handful of houses to the south of Lord Street. That has been the case since very early on in the planning of High Leigh and is what was presented at the Spotlight. The proposals for how long the road will be closed seems slightly scattered. We have heard 7 weeks, 10 weeks and 15 weeks. Also please be aware the closure is only one part of it, they are seeking permission to perform works on Lord Street for up to 18 months it is estimated. It is a shame that Jeff Stack won’t make Broxbourne Council liaise regarding parking. He seems to believe the onus is on the residents to see that they have parking. We are disappointed that Jeff Stack has brushed off the matter of gritting Mangrove Road. We understand this is Hertfordshire County Councils duty but it would be nice if the district council could see that this happens. We await confirmation on refuse collection, it only seems to be expected currently rather than a definite at this stage. It is surprising that such large scale works do not have to be present in the planning permission in any capacity, especially as some of the works will occur on the area defined as High Leigh Garden Village. The sub-station required separate planning permission as it was not included in the original planning permission. We are concerned with the original planning permission, it is vague and lacks detail. Due to the insufficient original planning permission multiple additional permissions for various things have had to be sought by the developers and contractors to close roads, build sub-stations and prevent nuisances notices being severed (Section 61 of the Control of Pollution Act 1974). This mishmash of various permissions has created a ‘patchwork’ of documents between local authorities and developers attempting to carry out the works. We are concerned that the planning permission originally agreed is not being followed. We are glad Jeff Stack agrees what was said at The Spotlight. However why isn’t it being honoured? If you will be unfairly affected by the impending Lord Street closure and works please see the Your Rights page. We anticipate all users of Lord Street and residents nearby will be impacted significantly. These utilities works on Lord Street have been kept secret until recently for High Leigh Garden Village.